FOUR world’s records in steam traction were claimed in 1935 for a London and North Eastern Railway Pacific locomotive of the A4 class. 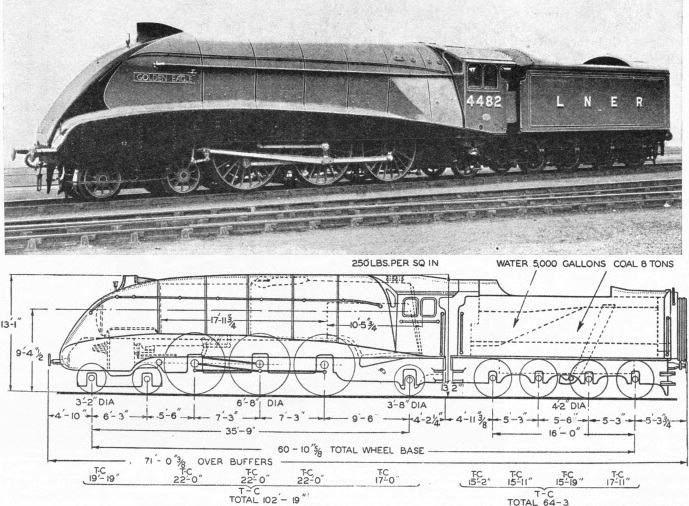 Engines of this class are streamlined developments of the well-known high-pressure 4-6-2s of the A3 class, designed by Sir Nigel Gresley. No. 4482, Golden Eagle, illustrated above, is one of a class of seventeen A4 Pacifics built in 1936-7 to haul the fastest expresses on the LNER. Four earlier engines, of the Silver Link class, were built in 1935. Their duties include the haulage of the Silver Jubilee express between Newcastle-on-Tyne and King's Cross, London. This train, whose standard make-up is seven coaches, weighing 220 tons tare, is booked to cover the 268.3 miles between the two cities in four hours, with an intermediate stop at Darlington. Engines of the Golden Eagle class differ from the four of the Silver Link class, in that they are painted in the standard LNER colours, whereas the earlier engines were finished in grey to tone with the colour of the Silver Jubilee train. Locomotives of the A4 class have three cylinders 18½ in diameter by 26 in stroke. The boiler has a total heating surface of 3325.2 sq feet, to which the tubes contribute 2345.1, the firebox 231.2 and the superheater 748.9 sq feet. The working pressure is 250 lb per sq in. The cylinder diameter is half an inch less and the working pressure 30 lb more than in the A3 Pacifics. The grate area is 41¼ sq feet. Tractive effort, at 85 per cent working pressure, is 35,455 lb. The driving wheels are 6 ft 8 in, the bogie wheels 3 ft. 2 in, and the trailing wheels 3 ft 8 in diameter. The engine weighs, in working order, 102 tons 19 cwt, of which 66 tons are available for adhesion. The eight-wheeled tender has a coal capacity of 8 tons and a water capacity of 5,000 gallons. The weight of the tender, in working order, is 64 tons 3 cwt. Particular attention has been given to the streamlining. From the buffer beam a casing, extending across the width of the locomotive, rises in a curve to the top of the boiler and merges at the rear into the wedge-shaped front of the cab. A lower casing on either side of the engine covers the cylinders and sweeps back in a curve to the base of the cab. Thus the streamlining forms a horizontal wedge, which tends to lift the exhaust, steam clear above the cab.